Background: Simulation-based teaching of basic skills in minimally invasive surgery (MIS) has become an important component of general surgery residency curricula. Of these skills, intracorporeal suturing is one of the most difficult to teach. Optimizing learners’ ability to acquire this skill efficiently is beneficial. Increased self-confidence is the first step toward skill acquisition. 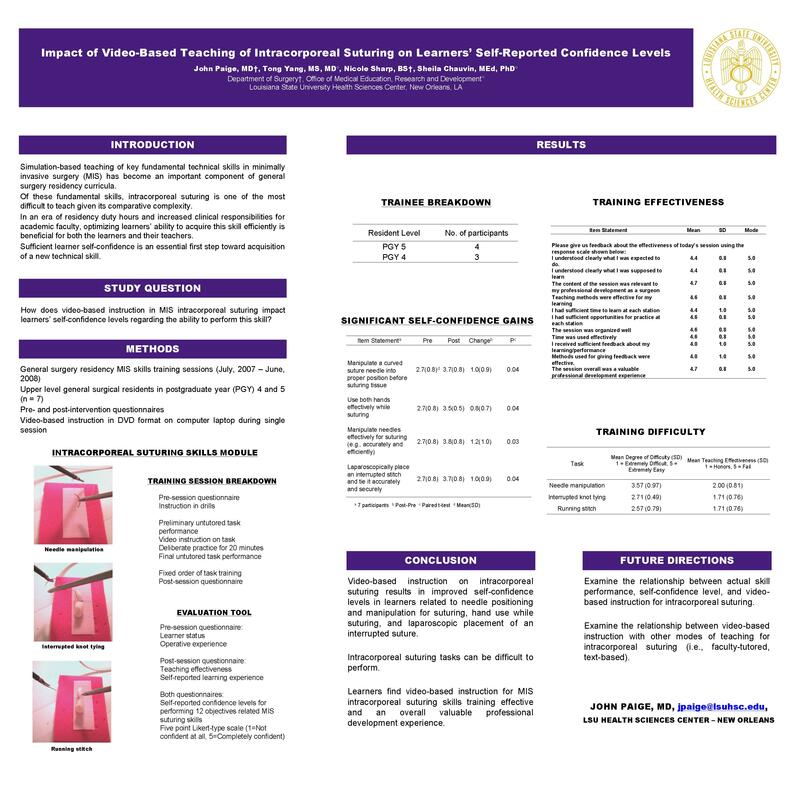 We examined the impact of video-based teaching of intracorporeal suturing on learners’ self-confidence levels. Methods: During the 2007-2008 academic year, a total of 7 senior level (postgraduate year [PGY] 4 and 5) general surgery residents underwent video-based instruction in intracorporeal suturing on an inanimate box trainer during a single session. Participants completed pre- and post-session attitudinal questionnaires using a 5-point Likert-type scale focusing on self-confidence in performing various targeted intracorporeal suturing skills. Total mean scores and mean gains were calculated from the questionnaires. Paired t-test was used to determine the impact of the video instruction on self-confidence levels. Results: Self-confidence ratings were complete for all 7 forms. Statistically significant gains were demonstrated for 4 out of 12 intracorporeal suturing skills on the questionnaire. The range of mean score change was 0.8 units (p=0.04) to 1.2 units (p=0.03) on a 5-point Likert-type scale. Conclusion: Video-based teaching in intracorporeal suturing appears to have a positive impact on senior resident self-confidence levels. Further research is needed to determine whether such an increase in self-confidence levels translates to improved skill performance.